OCTOBER 2018 I FLEX007 MAGAZINE 19 ity is dependent on design, not on the assem- bly process. It is easy to arrive at the conclusion that mov- ing to a rigid-flex design does simplify things for designing, purchasing, assembling, inspect- ing, or even accounting. However, the question is, "Does this simplification justify the cost?" Each application should be reviewed individu- ally. While not all-inclusive, Figure 1 shows a sample comparison and provides a good place to start a discussion. Fabricators Moving ahead with your rigid-flex design, how can your fabricator help? 1. Stiffeners versus rigid-flex Flex with stiffeners to support component areas is a less expensive alternative to rigid- flex and worth the discussion. The primary dif- ference in a simple design is the rigid-flex will 3. Assembly operation Similar to the concept of the cost of the design, a rigid-flex solution requires only one assembly. The PCB and cable solution can require two, three, or even more individual boards to be assembled. The total cost of assembly should be included in this review. This includes a similar list to the one in point two, along with multiple set-ups of the assem- bly equipment, and engineering time required for each assembly operation. 4. Testing Not only does rigid-flex require one test operation compared to possibly several for individual boards connected by cable, but it also provides the ability to test the full assem- bly before installation. 5. Order processing The cost associated with processing orders is often overlooked. Rigid- flex is one unit. Multiple boards, cables, and con- nectors can require sev- eral purchase orders to be placed, monitored, received, inspected, han- dled, stored, and payment processed. These costs should also be captured in a comparison of both options. 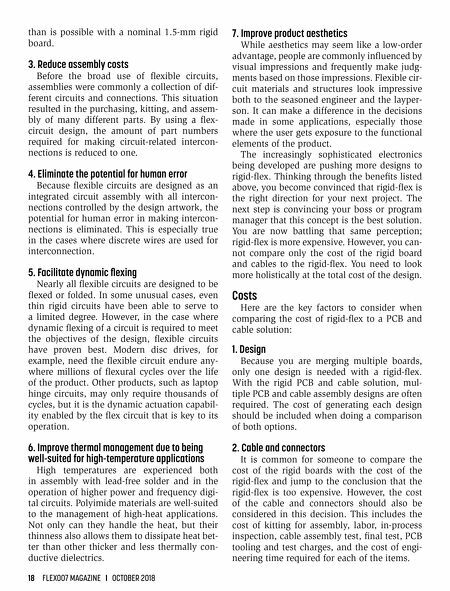 Reliability Without question, the rigid-flex option is consid- ered a high-reliability alter- native to the PCB and cable solution. For many years, rigid-flex was predomi- nately a mil/aero solution, but over time has become common in nearly all mar- kets. The connector is an integral part of the board; there are no solder con- nections between boards. 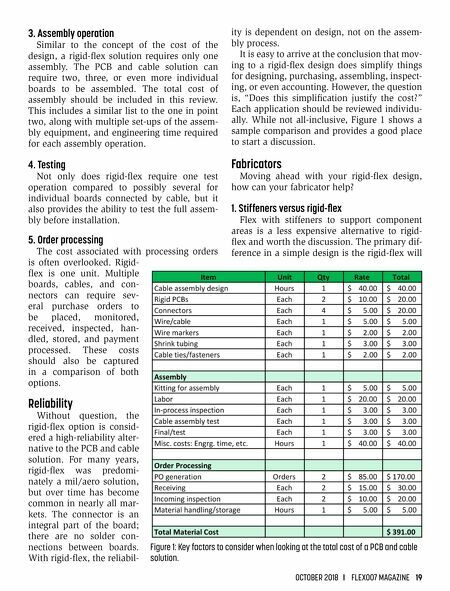 With rigid-flex, the reliabil- Figure 1: Key factors to consider when looking at the total cost of a PCB and cable solution.